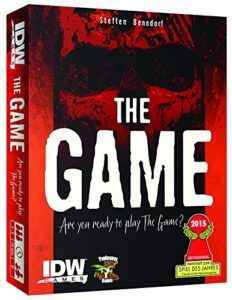 This The Game review is based on 10 plays, including at least one game at each player count. The Game is a cooperative hand management game in which you and your teammates are trying to play as many of your cards as you can. It was designed by Steffen Benndorf and published by IDW Games. 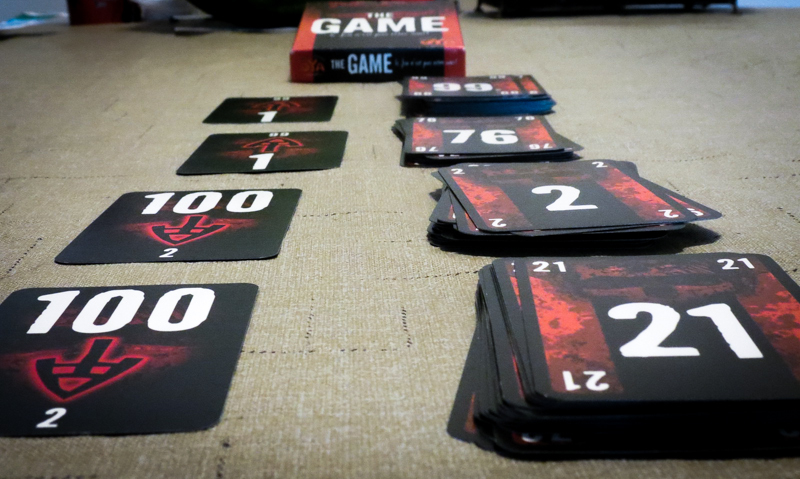 You begin The Game by dealing out cards and setting up the four rows you’ll be using. Two of those rows will have cards going from 100 to 2 in descending order, while the other two rows will go from 1 to 99 in ascending order. The starter cards are two 100s and two 1s, so those numbers will not be found in the deck. On each turn, you’ll be trying lay down two or more cards to one or more of those rows. The deck only has one of each number, though, so it will be tough to get them all down. You are allowed to jump backwards or forwards if you have a card that is exactly 10 higher or 10 lower than one of the cards on a pile. For example, if there is a 35 in one of the ascending piles, then you can play a 25 to bring it back 10. You can’t tell your teammates what you have in your hand, but you can let them know when you think a pile should be left alone so you can play cards there on your next turn. Of course, sometimes they will have to play in those rows if they can’t legally play anywhere else. After you’ve played your cards, you will draw back up to a full hand. Once there are no more cards in the deck, you will only have to play one card at a time. The game ends when the current player can’t play the minimum number of cards on their turn. Your goal is to end up with 10 or fewer cards between you when the game ends. The Game is extremely easy to learn and teach. I’ve taught kids and adults with no problems whatsoever. While you can’t talk about your cards in this game, the cooperation level is still quite high. You really have no shot of winning unless you let others know when you need a row to be left alone. This game also creates quite a bit of tension. You know that at any second someone could jump up or down by 30, leaving you with a pretty dead hand. You’ll have a lot of moments like that, which is great if you like tense, challenging games. It also makes winning feel like quite the accomplishment. There are some classic moments in this one, too. For example, in one game I had the 95, 85, and 75 in my hand, so I was super pumped when no one played in the row I needed. That actually saved one of our games. This, like Hanabi and a few other pocket-sized cooperative games, is a fantastic travel game. It’s probably best at 2-3 players, but it actually works well at each player count. Why-oh-why did they decide to use this name? It’s tough to search for, it’s tough to talk about (“What game do you want to play? The Game. What game? No, The Game!”)… it’s just a bad name. Considering this is such a light card game, I’m surprised they decided to put a picture of a skull on every card. That’s pretty dark for what’s supposed to be a family game, so maybe more playful artwork would have worked better in this case. There’s no theme here, so they really could have used any artwork they wanted. None of us like the name, but we all like The Game! It’s quick, it’s challenging, it requires a good amount of cooperation to beat, and it has quite a bit of replayability. This is one we’ll be keeping. 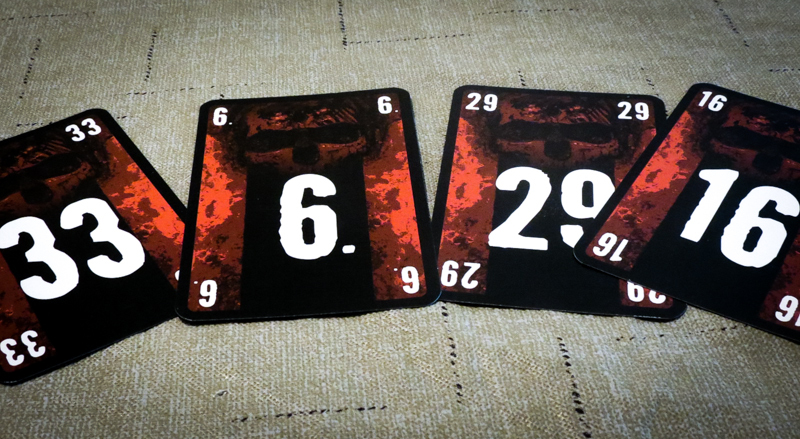 If you’re looking for a nice filler card game with some tension, The Game is one you’ll want to check out. If you like small co-op card games that the whole family (gamers or non-gamers) can enjoy, this is pretty much a must-buy. It’s probably not a game you’ll be playing all the time, but it’s one that most people will be happy to have on their shelves. You can test this one out by getting The Game app for iOS or Android. Thanks for taking the time to read our The Game review!